My last encounter with Sinigaglia’s Violin Concerto was via an archive recording by the excellent Alfonso Mosesti on Rhine Classics (review). However, that 1959 mono broadcast can’t be expected to provide the plush aural perspective of a 24-bit digital recording such as this one, and nor does it. In that respect this Tactus recording, made in Ferrara in 2013, must stand alone. 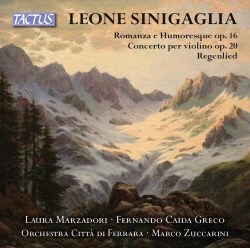 As I wrote in my previous review, Sinigaglia’s 1899 Concerto is an attractive proposition. It has something of the open-hearted quality of the Dvořák, the freshness of the Goldmark and a full quotient of ripe lyricism cut from high late-Romanticism. The central movement is a meditative Arcadia, enlivened by the violin’s songful lyricism. That said, the new recording sounds rather circumspect alongside Mosesti and Ferruccio Scaglia’s incisive drama. The disparity between tempi is also startling, the older recording taking 28 and a half minutes, the newer one getting on for 37. It totally changes the concept of a concerto that in Mosesti’s hands is incisive, expressive and exciting and in the admirable young Laura Marzadori’s hands tends to sound like a rhapsody. Her opening paragraphs are really not the Allegro risoluto that Mosesti achieves and though her tone has sufficient sweetness and she plays with great delicacy there is, from time to time, too great a sense of caution and too little fervour: lacking propulsion, things can hang fire. The beautiful pastoral central movement responds well to Marzadori and Zuccarini’s refined thoughtfulness but there is surely more expressive intensity to be derived from a more athletic approach such as Mosesti provides, binding the work’s rhetoric tightly as he does so. In short, this is rather a small-scale reading, and a little subdued, where the finale’s passagework can sound clogged at the chosen tempo. The live performance may account for a degree of caution and you will certainly appreciate many of the concerto’s virtues – but for a reading of romantic fire I’m afraid Mosesti is on an altogether different plane. There are two welcome companion works that round out one’s appreciation of Sinigaglia’s output. The Romanza and Humoresque for Cello and Orchestra was dedicated to Francesco Serato, cellist father of Arrigo Serato, who was himself the dedicatee of the Violin Concerto. This brings things full-circle very nicely. It has alluring lyricism and its wistful qualities are adeptly brought out whilst the light side of the diptych, lively and genial and with a characteristically warmly textured, central panel can sound rather Dvořákian. The orchestra alone takes on the first of the Two Characteristic Pieces for String Orchestra. The Regenlied offers cantabile pleasures and if you think of the slow movements in the Serenades of Tchaikovsky or Elgar you won’t be far off the mark. It’s a shame that the Etude-Caprice didn’t follow but presumably that was a programmatic matter that evening in Ferrara. The booklet is attractively done with notes in Italian and English. The performances are polished and careful but for adrenalin and passion bear Mosesti in mind, sonics notwithstanding.